Cleopatra (69-30 B.C.) - Cleopatra VII Philopater (her full name) is one of the most famous women in history. She is often considered the final Egyptian pharaoh, and was the last monarch of the Ptolemaic Empire (not counting her son, Caesarion, who technically held the throne for 11 days). 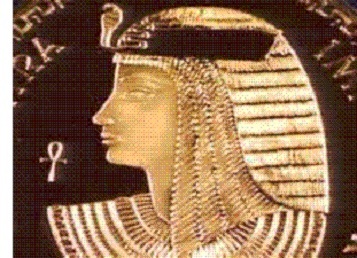 Under her reign and due in part to her actions, Egypt was absorbed into the Roman Empire in 30 B.C.. She was the tenth generation and direct descendent of Ptolemy I Soter, one of Alexander the Great's generals. Upon the death of her father, Ptolemy XII Auletes, in 51, she and her ten year old brother, Ptolemy XIII, became joint rulers; but she had no intention of sharing power. However, after a series of events, she was the one driven from power, and in 48 B.C. fled Alexandria. While this was playing out, Rome was in the midst of a civil war. The two conflicts intermingled when Pompey sailed to Egypt after his defeat at Pharsalus. When he arrived, he was immediately killed, probably under the orders of Ptolemy XIII, who wanted to make a friend of Julius Caesar. The plan backfired, though, as Caesar was not happy with the death of his former ally, and husband to his deceased daughter. Cleopatra saw an opportunity to regain power. According to Plutarch, she had herself smuggled into the palace inside a rolled up rug. When Caesar saw her, he was impessed by her boldness as well as immediately attracted to her. Accounts on her physical appearance vary, ranging from extremely to moderately attractive; but regardless, she must have been very charismatic, for her ability to persude powerful men is quite evident. The two became lovers and their son, Caesarion (meaning little Caesar), was born the following year in 47 B.C.. This spelled bad news for Cleopatra's brother. Caesar ordered Ptolemy XIII to abdicate and Cleopatra returned to the throne. Ptolemy refused to go without a fight, however, but died after losing the Battle of the Nile against Caesar and Cleopatra in 47 B.C.. His cause of death is uncertain, but it's commonly accepted that he drowned while retreating across the Nile. When order was restored in Egypt, Caesar returned to Rome in 46, and Cleopatra and Caesarion went with him. This created somewhat of a scandal in Rome as Caesar was already married. Cicero recorded in one of his letters that he hated the Egyptian queen, and Caesar's affair with her undoubtedly weakened his position. After his assassination, Cleopatra returned to Egypt with her son. Her alliance with Marc Antony began in 41 B.C., when he traveled east with the intention of going to war against Parthia. He stayed in Alexandria and the two began having an affair. In 40 B.C., she gave birth to twins. After going back to Rome, he returned to Egypt in 36 B.C. and never left. He and Cleopatra were married despite the fact that he was already married to Octavian's sister. This also marked the beginning of deteriorating relations between Antony and Octavian, who were now vying for the power of Rome. They broke completely when Octavian convinced the Senate to declare war on Egypt in 33 B.C.. The war ended with the defeat of Antony and Cleopatra at the Battle of Actium. With all hope lost, Cleopatra committed suicide in 30 B.C.. The ancient sources generally agree that the poisonous bite of an asp was the cause of death.